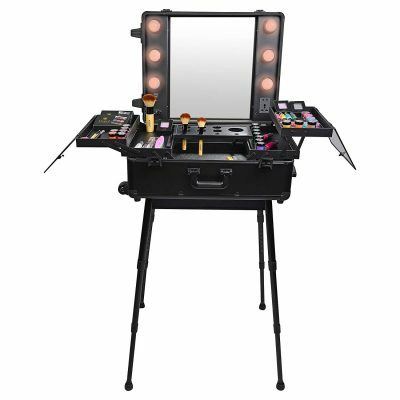 A table and 2 chairs provided by the venue is the norm but if you want to push the boat out and want something really special we have a variety of options perfectly designed to wow your guests and compliment your event. Please take a look at our different types of walkabout experiences or pop stands you would like to hire at your event. 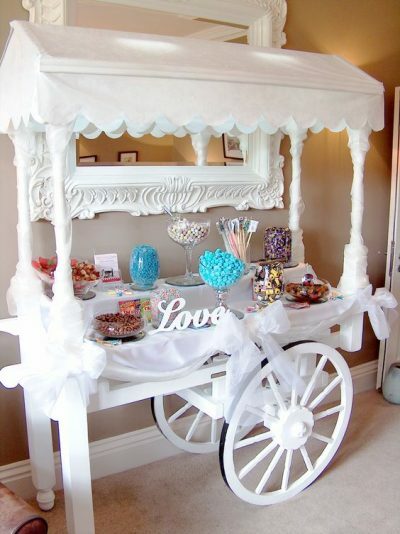 If you want to create even more of a unusual statement at your party then we can use the paint and glitter cart that we or your guests push around. Tidy, cool little set up to brighten up and make that dark corner much more interesting and inviting with a theatrical feel. 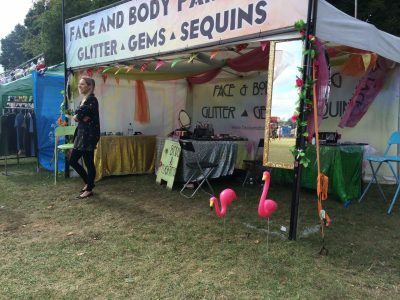 We have a static glitter wagon set up that we decorate to compliment your event a much more of a sophisticated, special feel to it. We have a colorful, decorated gazebo with large signage and flags so we can be easily located, works well for festivals and large events with outdoor areas. 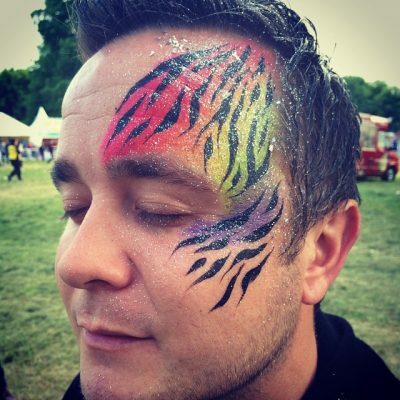 Walk about mobile face paint works great to float round approaching your guests and paint them in the very spot they stand in. It works amazingly to entertain crowds at weddings, festivals, clubs, corporate parties, office parties and sports events as well as entertaining large queues. 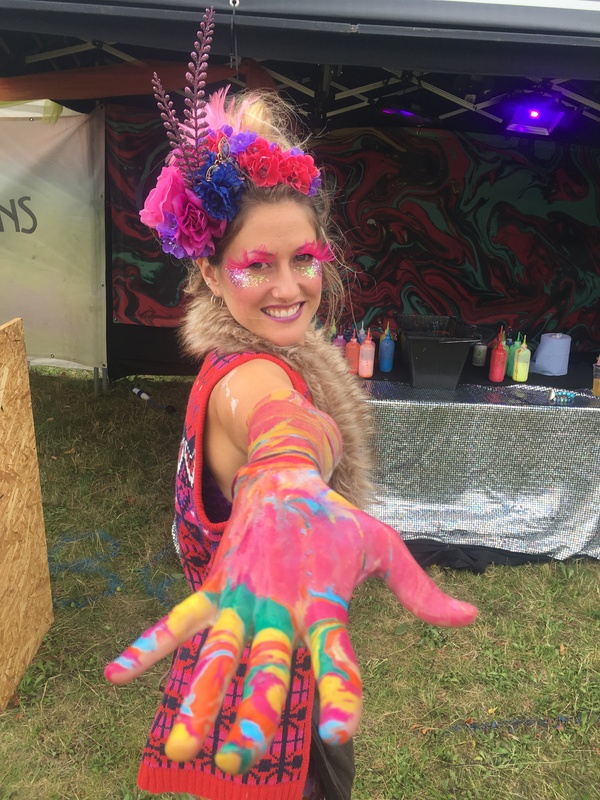 We float around discreetly transforming your guests in to glittery, painted pieces of art in minutes. It’s really interactive novelty experience and an unexpected surprise for your guests. 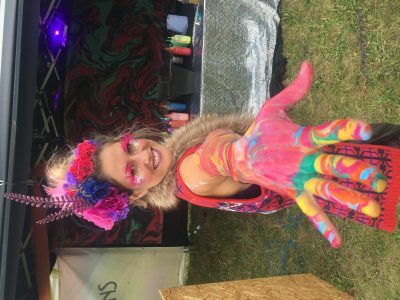 We can dress up on request or where any branded clothing to promote you on the way. We have a good range of designs when mobile but as you can imagine they tend to be smaller, quicker eye designs.